• For quantitative determination of chloride ion and evaluation of drug effects on chloride metabolism. • Sensitive and accurate. Use as little as 5 μL samples. Linear detection range 0.7 mg/dL (0.2 mM) to 35 mg/dL (10 mM) Cl- in 96-well plate assay. • Simple and high-throughput. The procedure involves addition of a single working reagent and incubation for 5 min. Can be readily automated as a high-throughput assay for thousands of samples per day. 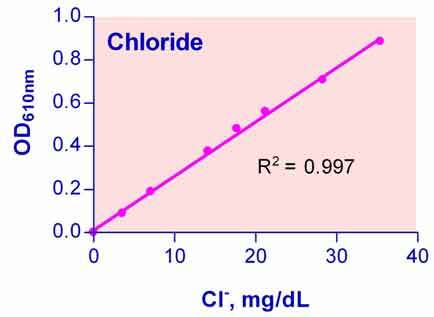 • Chloride is the major extracellular anion in human body fluids. Chloride plays a key role in maintaining proper water distribution, osmotic pressure and electrolyte balance. Low chloride concentrations may be found with prolonged vomiting, extensive burns, metabolic acidosis, Addisonia crisis and renal diseases. Elevated chloride concentrations are associated with dehydration, congestive heart failure, hyperventilation and urinary obstructions. Determination of chloride in sweat is useful in diagnosing cystic fibrosis. Simple, direct and automation-ready procedures for measuring chloride concentration in biological samples are becoming popular in Research and Drug Discovery. BioAssay Systems chloride assay kit is designed to measure chloride directly in biological samples without any pretreatment. The improved Fried method utilizes mercuric 2,4,6-tripyridyl-s-triazine, which forms a colored complex specifically with chloride. The intensity of the color, measured at 610nm, is directly proportional to the chloride concentration in the sample. The optimized formulation substantially reduces interference by substances in the raw samples. 1. Borenshtein, D et al (2009). Decreased expression of colonic Slc26a3 and carbonic anhydrase iv as a cause of fatal infectious diarrhea in mice. Infect Immun. 77(9):3639-50. Assay: Chloride in Mouse serum (Pubmed). 2. Peng, S et al (2010). Minimal effects of VEGF and anti-VEGF drugs on the permeability or selectivity of RPE tight junctions. Invest Ophthalmol Vis Sci. 51(6):3216-25. Assay: Chloride in Human junction liquid (Pubmed). 3. Rajapakshe, A et al (2010). Characterization of chloride-depleted human sulfite oxidase by electron paramagnetic resonance spectroscopy: experimental evidence for the role of anions in product release. Biochemistry 49(25):5154-9. Assay: Chloride in Human sulfite oxidase (Pubmed). 4. Gr?nberg, W et al (2011). Periparturient effects of feeding a low dietary cation-anion difference diet on acid-base, calcium, and phosphorus homeostasis and on intravenous glucose tolerance test in high-producing dairy cows. J Dairy Sci. 94(2):727-45. Assay: Chloride in Cow Urine (Pubmed). 5. Jensen, SB et al (2008). Adjuvant chemotherapy in breast cancer patients induces temporary salivary gland hypofunction. Oral Oncol. 44(2):162-73. Assay: Chloride in Human serum (Pubmed). 6. Ahmad, T et al (2009). Influence of varying dietary electrolyte balance on broiler performance under tropical summer conditions. J Anim Physiol Anim Nutr (Berl). 93(5):613-21. Assay: Chloride in Chicken blood (Pubmed). 7. Everaert, N et al (2011). Regulatory capacities of a broiler and layer strain exposed to high CO2 levels during the second half of incubation. Comp Biochem Physiol A Mol Integr Physiol. 158(2):215-20. Assay: Chloride in Chicken Plasma (Pubmed). • Chloride determination in beverages.